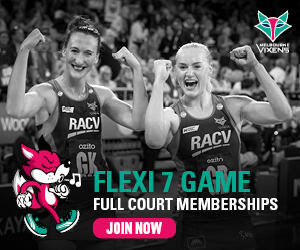 The Melbourne Vixens have made it two from two for their Bendigo Blockbuster weekend, defeating the Collingwood Magpies 61-56 at Bendigo Stadium. Out to seek redemption over the Magpies after their last encounter in Brisbane, the Vixens came out strong, prepared for a classic Victorian derby battle. The combination of Moloney, Watson and latest recruit Lara Dunkley in the midcourt allowed an impressive start, with the Vixens taking a three-goal lead early in the first quarter. A time out from the Magpies saw them reset and from then on in, a fierce competition was contended. The now iconic duo of Philip and Thwaites dominated across the game, while the assistance from Weston and Smith at GD and WD allowed resets to open up the Vixens attacking third. Bendigo born and bred Thwaites impressed in front of her home crowd, making use of the level of competition the Vixens will encounter in the 2019 season. “It’s fantastic to get the two wins this weekend, particularly today as it shows we worked on what needed to be done after our last game in Brisbane. “I’m just so happy to have Tegan in the circle with me - we have a really good understanding of each other’s games which is really helpful particularly in the goal circle. “Coming into these pre-season games, of course we want to win, but it is really about getting those building blocks to prepare us for the season proper. The Melbourne Vixens' Fan Day will be held at Federation Square on Thursday, 11 April from 10am-1pm. Tickets to the Vixens/Magpies double header at Melbourne Arena on Saturday, 27 April are available here.